Der Klapperstorch or the White Stork to us English speaking folks. It is called der Klapperstorch in German because of the sound it makes with its beak. The adult White Stork’s main sound is noisy bill-clattering, which has been likened to distant machine gun fire. The bird makes these sounds by rapidly opening and closing its beak so that a knocking sound is made each time its beak closes. The clattering is amplified by its throat pouch. Used in a variety of social interactions, bill-clattering generally grows louder the longer it lasts, and takes on distinctive rhythms depending on the situation—for example, slower during copulation and briefer when given as an alarm call. Like the adults, young also clatter their beaks.The up-down display is used for a number of interactions with other members of the species. Here a stork quickly throws its head backwards so that its crown rests on its back before slowly bringing its head and neck forwards again, and this is repeated several times. The display is used as a greeting between birds, post coitus, and also as a threat display. Breeding pairs use this display, as well as crouching forward with the tails cocked and wings extended. Wouldn’t that be awesome if humans used those behaviors to show greetings, or post coitus or when threatened? Your mate throws his head back and forth showing pleasure from the moment – or when greeting his best friends? Doesn’t matter which, it is all the same emotion. Back to the birds. When my parents and I were leaving Poland my mom shouted (way too early in the morning), “Did you see that?!”. I flipped the car around and lo and behold there was this stork nest!! 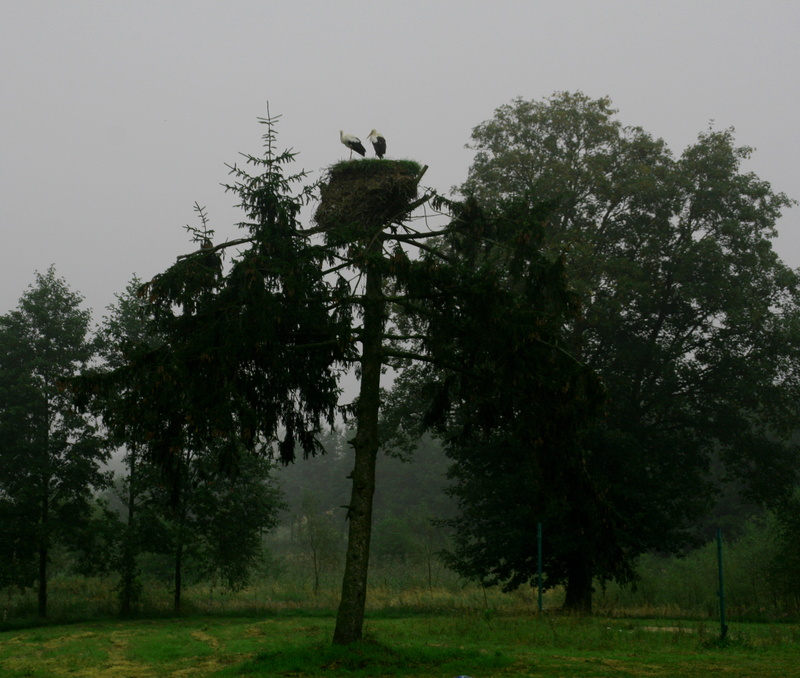 Have you ever seen a nest with storks in it? 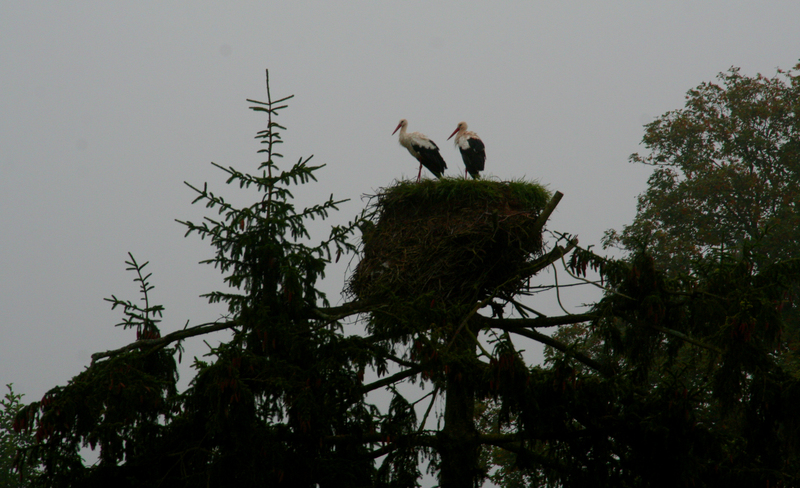 The nest was huge and these two adorable (yes, adorable) storks just hanging out. 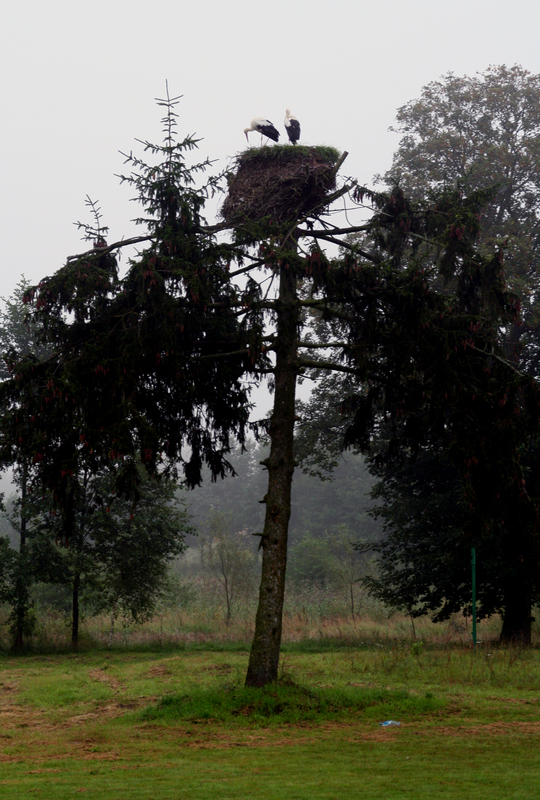 The White Stork breeds in open farmland areas with access to marshy wetlands (this nest was next to a large pond), building a large stick nest in trees, on buildings, or on purpose-built man-made platforms. Each nest is 1–2 m (3.3–6.6 ft) in-depth, 0.8–1.5 m (2.6–4.9 ft) in diameter, and 60–250 kg (130–550 lb) in weight. Nests are built in loose colonies. Not persecuted as it is viewed as a good omen, it often nests close to human habitation; in southern Europe, nests can be seen on churches and other buildings. I had noticed these large nest of twigs, mostly on top of homes, where the chimney was, I wondered why they would leave the nest there, because you cannot use your chimney with a stork nest on top of it. But since the storks do migrate to Africa in the winter maybe they would take the nest down when the migrated? And put it back when it was spring? Not sure, but once I first saw them, I noticed the nests everywhere. Storks!! They bring babies, have you heard? According to northern European legend, the stork is responsible for bringing babies to new parents. The legend is very ancient, but was popularised by a 19th century Hans Christian Andersen story called The Storks. German folklore held that storks found babies in caves or marshes and brought them to households in a basket on their backs or held in their beaks. These caves contained adebarsteine or “stork stones”. The babies would then be given to the mother or dropped down the chimney. Households would notify when they wanted children by placing sweets for the stork on the window sill. From there the folklore has spread around the world to countries such as the Philippines and South America.